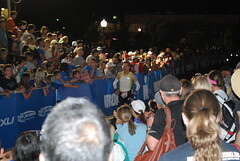 I first heard about swim-run when I met a guy form Sweden at Ironman Arizona in 2014. If you haven’t heard of it let me explain. Essentially you swim and run and swim and run your way around a course with a partner. You are allowed to use equipment but since you are all over the place you have to carry it all with you. It is HUGE in Sweden and has just started taking off here in the US. A friend of mine asked me to join her for a 22K swim run event in San Diego so of course I said yes! She was not quite ready for the challenge once the race rolled around so I paired up with her husband. The race happened to be in between a couple of really big storms to hit the area, so that added a bit of fun to the mix as well. OMG, so much fun but really really hard! As you can see from the pictures below we swam and ran our way all over Mission Bay in San Diego. The water was super cold so every time we got in the water it took a good 20 strokes before I could even get my face in. The weather was so crazy that they had to cut out one swim where we supposed to swim in the ocean around a pier. Because they took that section out, we ended up running close to a 10 K straight, half on the beach and half on the boardwalk by Mission Bay. You can see the Garmin data here. I messed up with my watch in the beginning so it is missing the first run and swim. Even every swim was a bit different. Sometimes we had nice beach entries and exits, sometimes we have to scale big sharp, slippery, unstable rocks to get in or out. Only one swim was really tough. We swam across Sail Bay and it was really choppy and hard to site. We swam with buoys and paddles and shoes and then ran with buoys and paddles and shoes! As partners we actually were did very well together. I was a bit better at the swim which was good because Scott could just followed my bright colored shoes. He was a bit faster on the run so I just did my best to keep up. We were both working hard and having fun so it was a great day. Stuart and Tracy were chasing us around on bikes taking pictures and posting Facebook Live videos. It was a ton of fun! The race organizers put on a fantastic event! We started and ended at the San Diego Rowing club so we had nice hot showers and a huge spread of food. I may have eaten 4 slices of pizza and two sandwiches after the race! If you ever have a chance to do one of these, do it! UPDATE!!! Here is a video from the day! If you didn’t know it already, Garmin has a market place of sorts where you can find cool things to add to your Garmin device. It is called Connect IQ. I had a comment on another post yesterday asking about how you add a data field from Connect IQ to your device. So here you go! In the Garmin Connect Mobile app on your smart phone find the Connect IQ Store selection in the more menu. 2. Search the store for the field you may like. There are many options for searching. Make sure you are searching for a field that is compatible with your device. 3 & 4. Select the data field you want and download it. You should get a notification after it is downloaded that it will be available on your device after you sync the watch. 6. Navigate to the Activity Settings for the desired activity (I am doing running). 7. Use the arrows to select the Data Screens. 8. For this example we need the layout set to one field for this screen. 9. Click down one time to choose the field. The trick here is that the fields are listed with like fields (HR, Pace, Power, etc…). You should find a selection for Connect IQ. 10. Select the correct field and then get out of the settings by using the back button. 11. Navigate through the screens while in the activity and you should see the new field! There are some really cool things available in Connect IQ. My favorite thing is choosing a new watch face! If you have any other questions or functionality you need help with please let me know! I made the mistake of looking at my 2016 totals with 6 days left in the year. I was 275 miles from 5,000 total miles for the year and a plan was quickly hatched. I had a long ride planned on Saturday so I only needed to do 200 miles in 4 days… 50 miles a day. My kids were at their dad’s for the week which gave the time to do doubles so I wasn’t on my trainer for 3 hours straight a day. There were a few things that I focused on to get this done. Fueling properly while riding, wearing the comfortable kit so I could keep getting back on the bike, fueling properly after the ride, and making sure to do some physical recovery activities. For fueling during the ride I relied heavily on Carborocket Half Evil. I like this product because it has everything you need in it; calories, electrolytes, and aminos. Now, I did add a half coop of Base Aminos to my bottles because I was putting in a MUCH higher volume of training than usual. I used the Dark Cherry Half Evil with some watermelon Base Amino (when really cold this tastes like a Cherry Icee!). For comfy kit I wore Coeur Sports Tri shorts. There is nothing better out there and the fact that all is good “down there” after 18 hours of riding my bike in one week speaks for itself. If you haven’t tried these shorts, you need to do so now! Game changer! Fueling properly after the ride usually consisted of a recovery shake or at lest some healthy calories very soon after riding. I was very diligent about this. I made sure to always eat something very soon after my ride. For the recovery shake I used Skratch Vanilla mixed with coconut milk until I ran out! So yummy! I will admit that after the long ride on Saturday (which was in the cold rain for the last two hours) we had fries and hot chocolate. It was the quickest thing we could get. Now the last part I focused on was physical recovery. I did this by making sure I stretched, foam rolled, and used my recovery boots. 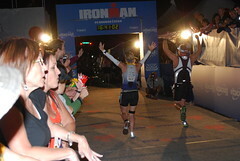 Stuart and I got ourselves an early Christmas present at Ironman Arizona, a set of boots from Rapid Reboot. I can’t say enough good things about them. I used them after every single ride this week! My favorite part the day! They are not the cheapest pair on the market but they are far from the most expensive. I can tell you that they work and I think they are going to help me immensely as I train for Ironman Wisconsin this year. And with that, I made my goal! Onto 2017!